Mountain Dew is partnering with DreamWorks Pictures and Paramount Pictures in conjunction with the July 4 release of the live-action film Transformers. Michael Bay, director of the Transformers movie, doubles as director for the ‘Transform Your Summer’ campaign. 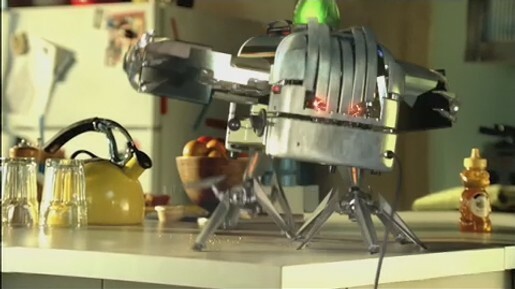 The “Transform Your Summer” Mountain Dew spot is set in an apartment kitchen where a young man tries to get the last Mountain Dew away from a toaster that transforms into a toaster-bot. The Toaster ad was developed at BBDO New York by chief creative officers David Lubars and Bill Bruce, with creative director/copywriter Brian Donovan, creative director/art director Mike Boulia, agency executive producer Amy Wertheimer, and agency assistant producer Theresa Ward. Filming was directed by Michael Bay via The Institute, Los Angeles. Editor was Tom Muldoon at Nomad Editing Company. VFX were developed at Digital Domain. Sound was mixed by Tom Jucarone at Sound Lounge.